It seems that new posts about what the Internet has in store for us down the road pop up every week or two. Some propose that the Internet will deliver more of the same, but different somehow (it’s usually ambiguous just how), while others propose such radical changes that it’s hard to believe they could ever happen. And the truth is, none of us really know what will happen with the Internet in 10 or 15 years. Update (27.09.2010): this article caused quite a heated debate in the design community. Please read the rebuttal of this article, called I Want To Be A Web Designer When I Grow Up here, at Smashing Magazine. After all, it was only a little more than 15 years ago that Clifford Stoll wrote the now-infamous “The Internet? Bah!” post (subtitled: “Hype Alert, Why Cyberspace Isn’t, and Will Never Be, Nirvana”). In that post he detailed why a lot of things just wouldn’t happen online but most of which are now commonplace. As web designers and developers, what the future holds for the Internet is imperative for our livelihoods. If the Internet has radical changes in store for us, we need to understand how they might effect what we do to earn a living and what we’ll need to do to adapt and keep pace — if that’s even possible. Look at your mobile phone. If you’re like most tech-savvy consumers, you’ve likely got a smartphone of the Apple or Android variety (or maybe a Blackberry, especially if you’re working in the corporate world). Most of us use our smartphones on a near-constant basis doing everything from checking email to working on projects to entertaining ourselves. How much of all that do you do in your phone’s browser? The answer is probably “not much”. We use an app to check email. We use the Facebook app for status updates. We use Twidroid or TweetDeck or the official Twitter app for tweeting. We use a YouTube app to watch videos. We use the Pandora or Last.fm apps for streaming music. 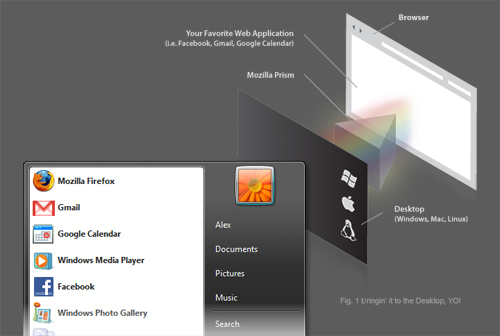 Mozilla Prism is an application that lets users split web applications out of their browser and run them directly on their desktop. Is this the future of mobile applications? It’s likely a similar scenario on our desktop or laptop computer. We use apps for a lot of our common Internet-based activities. We even have options to create our own apps with single-site browsers (like Fluid or Prism). And Google’s Chrome OS is just around the corner with devices already planned to use the web-based OS. 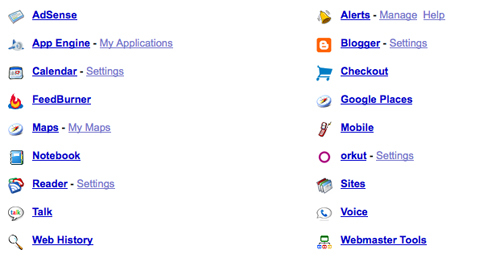 Look at how many WordPress sites use one of less than a handful of standard mobile themes. It doesn’t matter what the site looks like in a standard browser; open it up in your mobile browser and you’re often greeted with a page that looks exactly like the last 10 sites you visited. This is because for most users, design is irrelevant. That’s not to say they don’t appreciate good design. Many of them do (and many of them don’t). But they’re on a website because of the content. They don’t care about visual design, and they don’t care about interaction designer that much, either: as long as the design doesn’t give them a headache or interfere with their ability to find what they want, they don’t really care how exactly it looks like or how exactly it is working. The most widely-used mobile themes offer the content in an optimized format for mobile viewing. That makes users happy. It’s not just apps that will pull data directly, without the need for an actual website. Devices are making real headway in this manner. We have cars now that can pull information from the Internet for you. 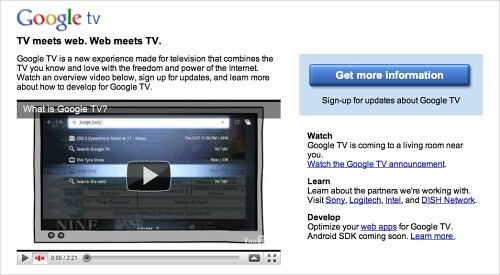 Soon devices for Google TV will be out in the marketplace, pulling video content from the Internet without the need to visit a website. Soon devices for Google TV will be out in the marketplace, pulling video content from the Internet without the need to visit a website. It’s likely that more devices will add Internet integration in the near future. At some point we’ll probably have refrigerators that automatically generate shopping lists for us (including any available coupons and where the best prices can be found that week): based on previous shopping habits; what we currently have; and our average usage rates for different foods. This is just one example of how online data and content will become infinitely more important than the designs surrounding that content. It’s impractical to have apps for every website we visit. Most of us visit hundreds or thousands of websites every year. What’s more likely to happen is that most of our content will be delivered through aggregators. Who will these aggregators be? Currently, there are three big players on the Internet that are likely to continue to be the primary content delivery platforms. Who are they? Twitter, Facebook and Google. Think about where you spend most of your time online and you’re likely going to find that those are the sites you visit most often. This market share is only going to increase. Look at how much content is now aggregated through Facebook. They have pages for virtually every topic under the sun (most of which have canned content taken directly from Wikipedia). Post a YouTube video to Facebook and your friends can watch it right there, without ever leaving Facebook. 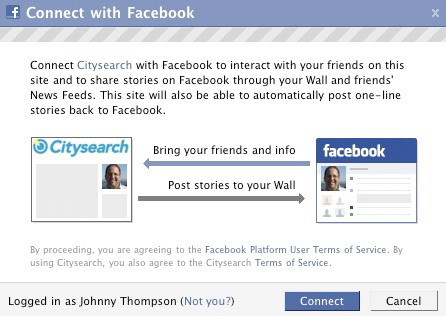 Even third-party applications like Networked Blogs stick pretty closely to the Facebook environment. Post a YouTube video to Facebook and your friends can watch it right there, without ever leaving Facebook. Even third-party applications like Networked Blogs stick pretty closely to the Facebook environment. Besides that, look at the gaming environment that’s cropped up on Facebook. I’ve lost track of how many updates in my news feed are directly related to games like Farmville or Mafia Wars. Facebook has grown into such a complete online ecosystem that many users might never find a reason to leave. Facebook shows no signs of slowing down either. They’re expanding their business and their reach – a trend that’s likely to continue for as long as they can sustain it. Google already has its hands in virtually everything online. It has two operating systems (Chrome OS and Android), its own browser, web applications that allow you to do a lot of things that used to be limited to desktop applications and the most-used search engine in the world put it in a pretty solid position to continue to be a major stakeholder in the future Internet. Google is also one of the more forward thinking and active participants in Internet policy and technology. It has a vested interest in how the Internet shapes up in coming years and will push to shape that Internet in a way that benefits its business model. I can see a future where Google doesn’t just offer a list of search engine results, but actually shows you the content you’re looking for without ever leaving their sites. If you look at Google’s complete product offering, it’s easy to see that it wants to be the primary online destination for most people (or maybe even all people). Google is firmly positioned in blogging, video, search, business applications, webmaster tools, ecommerce and even phone services – expect its reach to expand even more. Is there room for other services? There are always going to be innovative startups online. Most will fall by the wayside soon after they’re started or are absorbed into other established companies. A select few will go on to become major influencers online. It’s unclear at the moment where there’s room for new companies and services online. The idea of more location-based services (going beyond FourSquare, et al) is probably the most promising as well as services that go beyond normal Internet activities and integrate into daily life more. If everyone is accessing web content through an app rather than a browser, then no one will care what a website looks like. The way it functions and the content it delivers will become the paramount concerns to users. There will be no more balancing of form and function on a website; function will override form. Form will retain a place in the design of apps. In all likelihood, content will be open to the extent that APIs will be developed that anyone can then use in application development – so the form in which an app displays that data will become what separates the good from the bad, the great from the mediocre. There are some big advantages to this kind of model where apps and a small number of content aggregators deliver and control most of the content online. One issue is bandwidth. If there’s no design being transferred to a device (because the application on the device already includes all the design elements), that saves bandwidth. As more and more activities are done online, we’re going to have to consider infrastructure costs. Lower bandwidth use per site will result in more bandwidth available. Another advantage is that there’s more potential for user control. Users can define their preferences on their device and see content in the way they want. This especially has positive implications when it comes to accessibility. Those who need special settings because of a disability will no longer have issues with unviewable content. Let’s face it: the technologies upon which the Internet is built aren’t the most efficient ones available. Part of this has to do with building upon infrastructure that isn’t as good as it could be. The Internet has to be backwards-compatible over very long periods of time. We can’t just suddenly change things, even if it is to make things work better in the future, if it causes half the sites out there to no longer function. With a content-based Internet that uses device-side applications for displaying data and performing tasks, we can create more efficient applications. We won’t need to make sure each application can handle a huge variety of content and processes (as browsers currently have to do), because we’ll know exactly the kinds of data that application will need to process. Practically, users will have a more integrated experience with the content they view and the services they use online. The Internet will become even more a part of everyday life, incorporated to such an extent that it’s seamless. It’s already happening in bits and pieces. Again, look at your phone. You probably use apps or widgets for things like checking the weather or generating a shopping list. These apps will become more integrated and will work better with the data available online. For example, you could use that shopping list to automatically find the best prices on products, either online or at your local stores. In all likelihood, that data would be aggregated through a service like Google Base. An online profile will become even more important for users. Rather than setting up every device or service you have, you’ll simply authorize the device to grab your profile and preference information from the web. Security and privacy experts will have a field day with this, but most consumers will opt to use it anyway if it means the difference between going through a two-hour manual setup process or clicking a button and authorizing it to set everything up automatically. What Does It Mean for the Web Design Industry? So what does this all boil down to? If the web becomes app-based and content-based, where do web designers fit in — if at all? The bad news is that if the Internet starts relying much more heavily on access via app rather than browser, there’s going to be a lot less demand for web designers. Companies won’t see the point in hiring someone to create an entirely bespoke website when they can just use a template and then feed all their content to Google and Facebook and Twitter. Developers, on the other hand, will likely see a boom in business. A lot of money will be exchanging hands for apps that work better than current offerings and apps that might be able to undermine the big players. Of course, all these apps also need design work, but it will be a lot less demand than there is now for website design. It’s likely a lot of designers will need to expand their offerings to cater to content creation rather than just web design. Websites aren’t going to go away any time soon. It’s likely that there will be a bigger market for templates and themes as companies stop paying for custom designs. And there will be certain kinds of sites (like portfolios or art projects) that will always want to be designed. Who Wins in All This? Users will also benefit as they’ll have a more integrated, customized experience. Their version of the Internet will be tailored specifically to them, based on their own wants and needs. They’ll get content in the manner they prefer and find most usable. Update (26.09.2010): We’ve got quite many negative responses for this article, like Web Designers Won’t Die Out, They Will Transition. At Smashing Magazine, we are aiming for strong, high quality articles and after reading the article we do think that it raises some valid points, and now in retrospect we understand why the title and the content may appear to be aggressive. We also can see where the accusation of trying to be sensationalist comes from. But it was never the intention of the article. We are trying to do our best to provide only relevant and high qualilty content, but apparently sometimes we see our things differently than our readers do. We do appreciate constructive criticism like the above post on Drawar. And we are listening to what you are saying. And we will certainly keep it in mind for our future articles.